Helmsman Hikaru Sulu, played by John Cho, will be back on the big screen on Thursday, May 16, when J.J. Abrams’ “Star Trek Into Darkness” opens in the U.S. and Canada. Paramount announced Tuesday that it is rescheduling the release date, which was originally May 17. 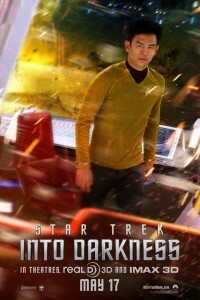 “Into Darkness” is a sequel to “Star Trek” (2009), which relaunched the franchise with younger versions of the iconic crew of the USS Enterprise from the 1960s TV series. Also reprising their roles are Chris Pine as Capt. Kirk, Zachary Quinto as Spock, Karl Urban as Dr. McCoy, Zoe Saldana as Uhura, Simon Pegg as Scotty, Anton Yelchin as Chekov, and Bruce Greenwood as Adm. Pike. Joining them are Benedict Cumberbatch as the new villain, John Harrison, Peter Weller as Adm. Marcus, and Alice Eve as Dr. Carol Marcus. The main cast is expected to appear in at least one more “Star Trek” film, although it is unclear if Abrams will direct since he has also committed to directing the seventh “Star Wars” film for release in 2015. The film will open on May 9 in Australia, New Zealand, Austria, Germany, Switzerland, the U.K. and Ireland, and May 10 in Mexico and Taiwan. Fans in Japan will have to wait until Aug. 23. The Hollywood premiere will take place on May 14 at the Chinese and Kodak theaters. Cho is scheduled to appear on “The Late Late Show with Craig Ferguson” on May 13 and KTLA’s morning newscast on May 14.